Last week I sent out a tweet marking a rather sad turn of events concerning one of the most notable game studios of all time. On further reflection, I wanted to say a few words here. On Wednesday, Sony shut down their European development house SCE Studio Liverpool. But, those reading this blog will likely better know the studio by its previous name, Psygnosis. Founded in 1984 out of the ashes of Imagine Software, Psygnosis earned high praise for their large catalog of 16-bit game titles, released during the ’80s and early ’90s, that consistently demonstrated unusually high quality graphics and animation, especially on the Amiga platform. In 1993, to strengthen their coming Playstation console, Sony purchased Psygnosis and channeled the studio’s talents towards their new platform. Most notable among the console’s early releases was the futuristic racing game Wipeout, which sold many Playstations for Sony, one of them to me. Psygnosis’ best known titles are probably the multi-platform hit Lemmings, Shadow of the Beast for the Amiga, and the Wipeout series. 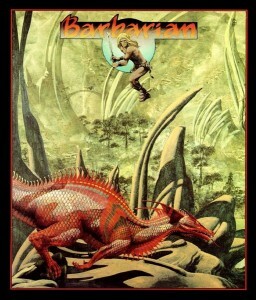 The first Psygnosis game I ever played was Barbarian on the Atari ST. It’s onscreen graphics were stunning, if the gameplay was somewhat disconnected, and the box art and pack-in wall poster by fantasy artist Roger Dean, whose work was featured in (and on) many Psygnosis releases, were striking. After I moved (back) to the Amiga, I often showed off the system’s capabilities to friends, demonstrating various Psygnosis games and their animated intro sequences. None were as impressive as Shadow of the Beast, however. The game’s controls may have been awkward and it didn’t offer the best gameplay, but the artwork, high number of onscreen colors, and amazing parallax scrolling were absolutely stunning. The day the news broke about the closing of the studio, I tweeted a short list of some of my particular Psygnosis favorites (well, those that would fit in 140 characters, anyway). I’ll repeat those here, in no particular order. It saddens me to see the Psygnosis story end, though, save for Wipeout (I bought a PSVita to play Wipeout 2048), my core connection to the studio is to do with games from decades past, which I still enjoy. But, then, 28 years is a pretty good run by anyone’s measure. This entry was posted in Amiga, Atari, Gaming, Multi-Platform. Bookmark the permalink. Good article, and I agree that it is very sad indeed to see Psygnosis shut down. You always knew an Amiga game was going to look fantastic when you saw the psygnosis logo appear! Although if I’m honest, I was more upset at the demise of Sensible Software. Forgot to add that you have a great blog… Always interested in reading your retro articles! It’s always bad news when a historic studio gets shut down and even worse news when people lose their jobs… On the other hand, I’m pretty sure a revival of Psygnosis as an indie studio would be amazing. I had an Atari ST in the late 80s/early 90s, and I remember Blood Money and Nitro very fondly. The music from both is in my head right now. I used to work in the next building to the original bunch of guys. They expanded and looked at a floor of the office attached to ours, the deal was almost done when Sony stepped in a bought them. Overnight the staff levels rocketed and they moved out to Wavertree into the current building. Sad news indeed, I even remember the Ocean office not far from where I am now!